Here are some of my completed motorcycle projects and projects still on the workbench. In addition to pictures, you will find a detailed construction diary for each model. I've organized the models by manufacturer since most individuals have their preferred manufacturer. What to use for display cases? 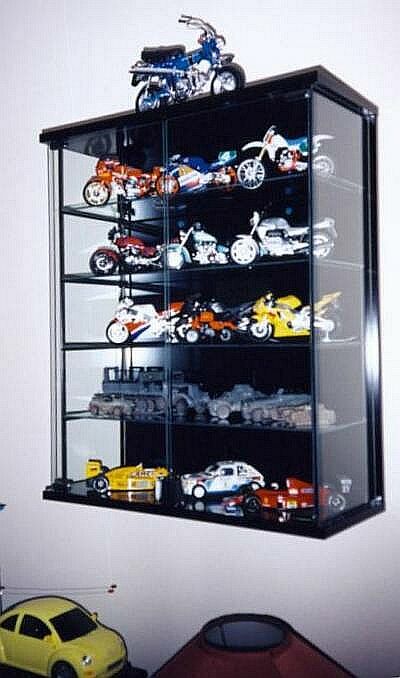 I've been looking for a long time for suitable display cases to protect my models. I found a couple of great audio CD cabinets at IKEA. One called the KRYSS cabinet and the other the BERTBY. I picked up four black KRYSS cabinets since it can hold twenty to twenty-five 1:12 models on it's five shelves. If you don't have an IKEA store near you, check out audio storage cabinets in your local furnishing stores. Note: The KRYSS and BERTBY cabinets are no longer available at IKEA. However in their 2004 Catalogue, there is a smaller wall mount unit called JÄRNA (W49xD17xH49cm) on page 98. It looks like it could hold 12 or more 1:12 bikes. It has glass shelves and sliding glass doors. The unit will hold 126 CDs (42 per shelf) so that'll give you an idea of its capacity. As a bonus, only $35Cdn!! The KRYSS units cost me $99Cdn. Honda's 'cute' little 50cc mini bike. Most North America's are probably remember seeing this when back in the '70s. However, the Gorilla (and Z50J-I Monkey) are still sold in Japan. Bicycles were used extensively by the Germans in WWII. Yamaha's cruiser has a brute of an engine, 1200cc, wrapped with an equally muscular looking frame and bodywork. In 1975, the Japan Ground Self Defense Force (J.G.S.D.F.) began to employ the Honda XLR 250R off-road motorcycle for reconnaissance use. Yamaha Motor Corporation calls the RoadStar "The ultimate streetfighter of the big-displacement cruiser class"
Although my site is dedicated to motorcycle modelling, I am also interested it other subject since my tastes are quite eclectic. For those who are like mined, here are some of my other models. I built the Schwimmwagen back in 2001 and always planned to build a base for it. However, I kept procrastinating since the only base I had done was for the 1:16 Kübelwagen. Although pleased with the asphalt driveway, I was not very satisfied with the look of the grass and gravel. So, that made me hesitant to dry a 1:35 base for the Schwimmwagen. Especially when water would be involved. I recently got the incentive I needed with an upcoming contest. I figured the only hope of finishing something to enter, was to finally build the base for the Schwimmwagen. Its been a while since I've worked on a motorcycle kit. I've spent a lot of time working on super detailing Tamiya's 1:16 Kübelwagen and have finally finished. This project allowed me to experiment with a lot of painting and metal working techniques that I think will prove useful on my future motorcycle projects.